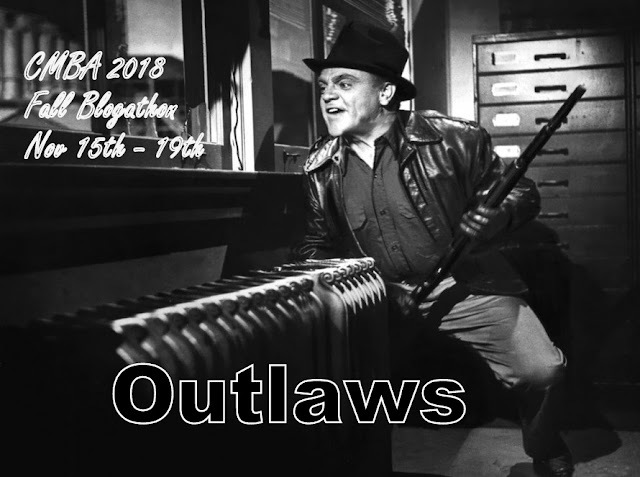 This article is part of the CMBA 2018 Fall Blogathon: Outlaws. Go here to read the other fine entries. 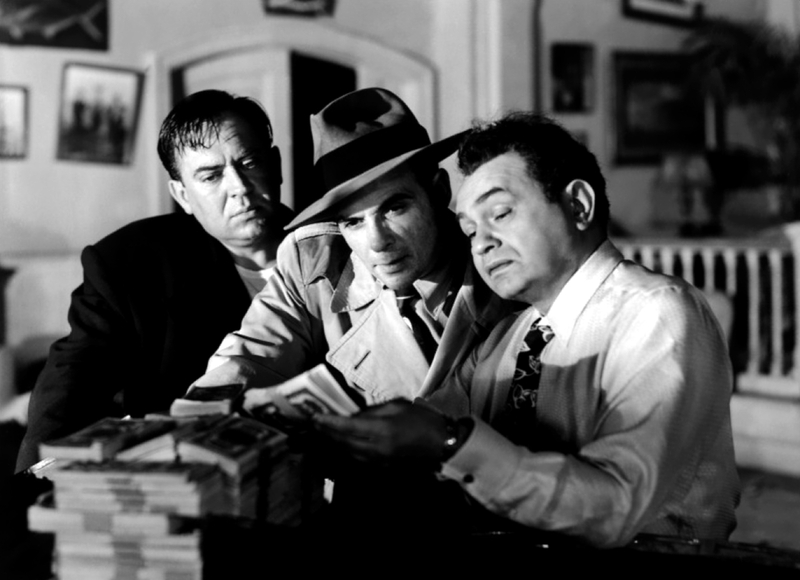 The photo above shows Edward G. Robinson at right with Thomas Gomez and Marc Lawrence; the chiaroscuro lighting is courtesy of the great cinematographer Karl Freund. The films of the old Hollywood studio system used up many reels of nitrate stock glorifying gangsters. Even when these fast-talking, sharply dressed criminals died in the end, which was frequently, they were often portrayed as essentially glamorous anti-heroes who were victims of their socio-economic circumstances (the best example of this type of film is Angels with Dirty Faces in which James Cagney is propelled to the electric chair by a youthful attempt to steal pencils) . The 1948 film noir Key Largo is one of the few classic movies that strips away old Hollywood's gangster myths and replaces them with an uglier reality: the mobsters who ruled American cities during the 1920s and 1930s were petty, destructive dictators who were a danger to democratic ideals. 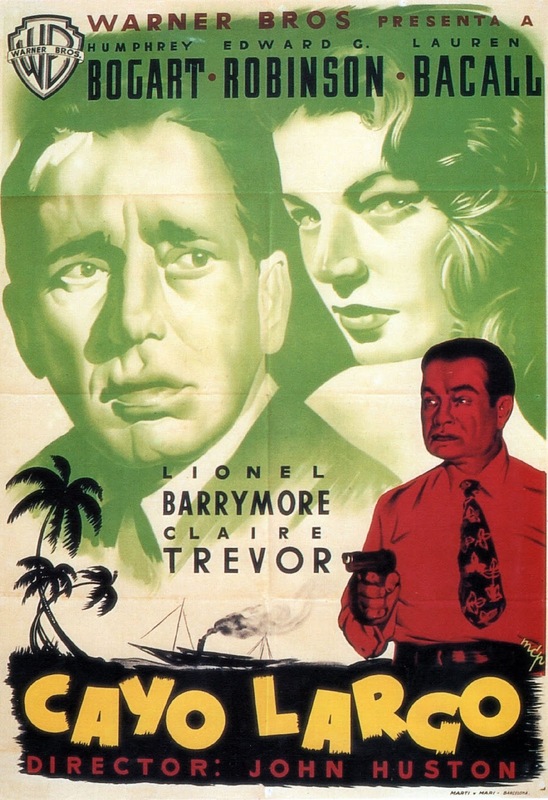 Key Largo begins with World War II veteran Frank McCloud (Humphrey Bogart) heading to the tropical islands off of south Florida to visit the family of George Temple, who was his best friend in the army. George was killed in Italy, and Frank is traveling to the hotel owned by George's father (Lionel Barrymore) to share memories of his friend. However, when Frank arrives at the hotel, he finds it inhabited by a group of suspicious people who claim they are on a deep-sea fishing expedition. In fact, they are part of the gang of criminals led by notorious mobster Johnny Rocco (Robinson) who are reuniting in the Florida Keys before heading to Cuba with a pile of counterfeit money. Key Largo is based on a 1939 play by Maxwell Anderson, although writer/director John Huston and his collaborator Richard Brooks changed much of the dialogue to reflect American values and attitudes in the Postwar world. In particular, Huston drew upon his experiences making the documentary, The Battle of San Pietro (1945), which depicts the fierce fighting between American soldiers and the Axis powers in Italy*. Key Largo was popular during its initial release in 1948: The film had a successful six-week run at New York City's Strand Theatre where The Count Basie Orchestra and Billie Holiday performed before screenings, and Claire Trevor won a best supporting actress Academy Award for playing Rocco's alcoholic girlfriend. Key Largo still holds up well today. It's one of Warner Bros great noirs with exceptional lead performances from Bogart and Lauren Bacall, memorable hard-boiled dialogue (Thomas Gomez, who plays Rocco's right-hand man, gets a lot of the best lines, although Barrymore has the time of his life yelling "you filth" at regular intervals) and exquisite cinematography from the legendary Karl Freund ( noir aficionados will really want to watch Key Largo on Blu ray or HD; it can be easy to miss much of Freund's exquisite lighting on DVD or TV). However, the movie's real draw is Robinson's explosive performance as Rocco. For the first third of the film, Huston expertly builds up tension regarding the mysterious guest in Hotel Largo's room 11, and when Robinson as Rocco first appears he blows everything else off screen with the force of one of the Keys' famous hurricanes. 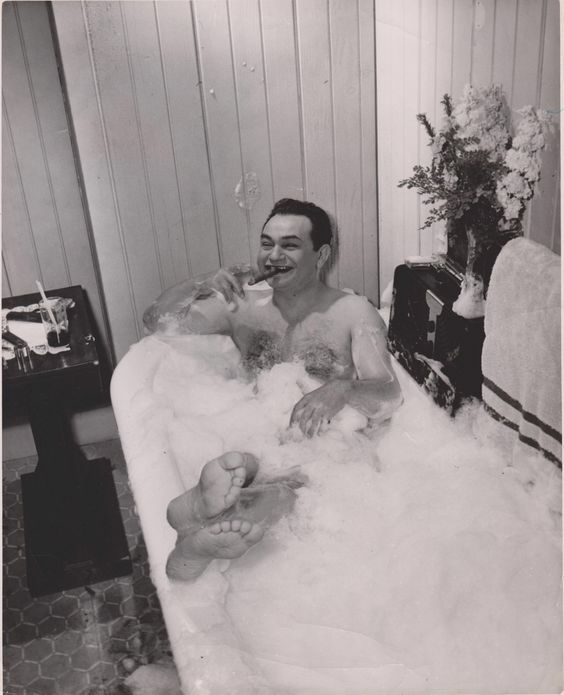 Huston introduces Rocco while he is reading the newspaper in the bathtub -- somebody on Twitter called this the Eddie G. beefcake shot, while Huston himself later said that Robinson "looked like a crustacean with the shell off." From that moment on, Robinson dominates the film with a masterful performance that ranges from comic mugging (see the shaving scene) to chilling menace. Edward G. Robinson in between takes on the set of Key Largo (1948). By the mid-1940s, Robinson had largely turned to character parts in films like Double Indemnity (1944), Our Vines Have Tender Grapes (1945) and The Woman in the Window (BTW, this movie is airing Nov. 17 on TCM), but his performance in Key Largo is a return to the role that made him a superstar in pre-code Hollywood. Johnny Rocco is an older version of Rico Bandello, the Al Capone-like gangster Robinson played in the seminal crime film Little Caesar (1931). All of the criminals in Key Largo express nostalgia for Prohibition, but Bogart's character makes it clear that the gun-toting anti-heroes who once reigned supreme in America's big cities are no longer welcome in the Postwar nation. In a speech that was no doubt shaped by Huston's experiences on the brutal battlefields of Italy, McCloud states that he and his fellow soldiers fought the war "to cleanse the world of ancient evils." What McCloud doesn't realize is that while he and his comrades were defeating Adolf Hitler and Benito Mussolini on the battlefield, America's homegrown tyrants were hiding like cockroaches in out-of-the-way places watching and waiting for their moment of return. Frank McCloud learns throughout the course of the film that the Johnny Rocco's of the world aren't as powerful or as terrible as their European counterparts, but that they are evil nonetheless. *** All the world weary Frank wants to do is settle down and have a quiet life by the sea (Bogart, in one of his most understated performances, exudes exhaustion from every pore), but, old soldier that he is, he must pick up a gun for one more campaign. Key Largo is available on Blu-ray, DVD and video on demand. *For more about Huston and other old Hollywood filmmakers World War II service read Mark Harris' excellent book, Five Came Back and/or watch the Netflix documentary. You can watch The Battle of San Pietro by following this link to the film's Wikipedia page. **Rocco refers to it as pompano in a brown bag, but most recipes now call for parchment paper. Here's a recipe from Emeril Lagasse that I'm going to try after the holidays. *** Rocco's crimes include cruelty and/or sexual harassment (implied because of the production code) towards every woman he meets, mocking of the elderly, killing a police officer, lying to the police, and leaving Seminole Indians without shelter during a hurricane. A great look at a remarkable performance of a despicable character. I find Key Largo endlessly fascinating on many levels. When Rocco calls McLeod "Soldier", it means so many different things. Yes, I noticed all the gangsters called Bogart's character "soldier" which is a brilliant piece of screenwriting. Oh boy, is Robinson a great outlaw in this film. Loved your post. I'm not a big Bogart fan, but Robinson really makes this film hum - kind of like he does with everything he has ever done. Great post! Robinson had such great range. He could be so vicious in one movie and play a meek nebbish in a movie like Scarlet Street. Nice review of a great movie. I too found it interesting how unglamorous the gangsters are portrayed here as opposed to 30s movies. We get the same with White Heat. No more living it up high style, just seedy surroundings and real villains as opposed to anti-heroes. Great observation. White Heat is in many ways Cagney's Key Largo. Thank you for reminding me how much I want to see this film again. Robinson is riveting in it, and it gives him even more to work with than Little Caesar (my cat is named after his Rico). When he gets spooked by the storm, I get chills. You've captured his character so well. I'm a cat lover and Eddie G lover (as you can tell by the avatar). Rico is a great name for a kitty. This is one of my favorite films, and Robinson is a standout in it. In an era where he was turning more toward intelligent, articulate and sensitive heroes, this was kind of a finale gangster role for him, a throwback to his earlier work. He still had it. Great post. It's nice that both EGR and Cagney (in White Heat) got to have their gangster swan song. I have seen this film so many times...and your review, in so many ways, reminds me why. Your putting the focus on EGR reminds what a great talent he was. He does get his due from time to time, but not as much he deserves, I think. Great piece, Amanda. Thanks! I always reckon James Cagney and Charles Laughton as the two greatest male actors of the studio period, but the more I see of EGR the more I think he belongs on the list. Just like Patty, I have seen this film many times and its gets better with each viewing. Robinson never gets old. EGR was a timeless actor. Thanks for all of your hard work in putting this together. I became a big Bogey fan when I was a kid, but as I got older, realized just how great an actor EGR was. Maybe the best American who didn't win an Oscar, I've often thought. And you're right, this film really shows him off. Very good post. I only wish it had been longer!